As technology continues to power the Age of the Customer, advances in artificial intelligence and machine learning are changing the way we do business. Conversational user interfaces are becoming widely adopted; voice-first customer service is a great way companies can offer customers help when and where they need it. Although today’s usage is minimal, with only 19% ever trying voice commands for help and 6% doing it frequently, companies need to be preparing to offer this emerging channel. Self-help: Voice search will be an important way to help users find information, self-serve tools, and live support. Chat: Enhanced voice AI chat will allow users to do more advanced and streamlined self-serve via chat. Phone: AI-enhanced phone support will personalize, improve and speed service by equipping agents with customer data, resolution paths, advanced decisioning for refunds/make good gestures and offers. What companies are leading the way in VUX? Unsurprisingly: Amazon and Google. Amazon Connect’s integration with Salesforce allows companies to input frequent customer requests into the platform to help the AI determine where to guide the customer (place an order, product issue, etc.). The contact flow begins with the AI gathering information and determining what the customer needs; if necessary, the customer can ultimately be transferred to a live agent. Capital One, a customer of Amazon Connect, has built out an Alexa skill as well. Customers can now use the Amazon Echo and Amazon Echo Dot to inquire about their credit card, checking and saving, and auto loan accounts. Customers can ask Alexa questions as sophisticated as how much they spent at Starbucks last month. Google Contact Center AI operates similarly and is partnered with companies such as Deloitte, Cisco, and Vonage. Google AI seems to have recovered well from its Google Duplex introduction and subsequent backlash. (Some have criticized Google Duplex for sounding too realistic, causing it to engage in arguably deceptive practices when interacting with humans.) Google’s AI is designed to work within existing partner contact technology, so that integration into a company’s VUX is simple and effective. Google’s AI uses open-ended questions instead of a phone tree to determine a customer’s history and assess their needs. Genesys is currently working to fully integrate Google AI into their voice-user interface. Contact Center AI, a virtual agent, first answers the call and addresses the customer issue if possible. If not, the agent passes the call to a human representative. That representative is helped by an Agent Assist system that continues to monitor the call and provide supporting information as needed. Mass availability is expected to begin in early 2019 (they also use Amazon Connect’s voice AI services on a different platform). Ticketmaster is looking into the viability of using Dialogflow by integrating it with its customer service IVRs to assist with intent recognition. They realized that many of their customer calls are about something general, like what time an event starts, yet complex, since each event they manage begins at a unique time and occurs in a unique place. Dialogflow could help them answer specific, complex questions within their current IVR system so that customers could receive the information they need without tying up agents with logistical questions. American Financing is also taking advantage of Contact Center AI to improve their call routing capabilities. By using Vonage’s CX Enablement Suite integrated with Google Cloud Contact Center AI, American Financing can intelligently route calls to high-skilled agents or after hours support internally. AI is a cost-effective way to intelligently route calls and create a simpler, hassle-free customer experience. Customizable VUX is a great way for companies to use voice commands to personalize their customer service and help figure out what customers need before they reach a live agent. 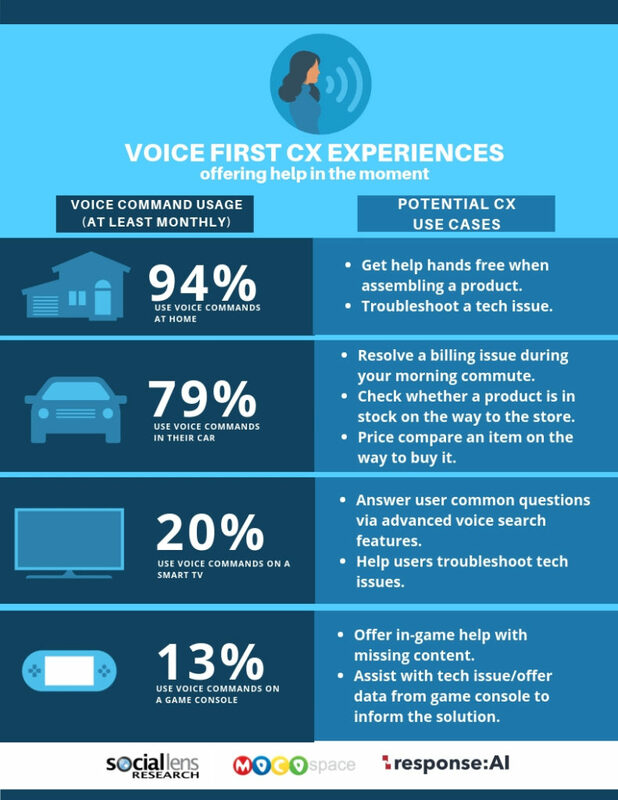 Voice-first experiences is the future of CX; companies and developers need to figure out how to best integrate new and existing voice-first CX strategies with smart devices so that customers can use voice to get easy, seamless, and timely support. We’d love to hear from you to continue the CX conversation!